Suits For Boys: Dress-up your Bezzie Boy with the Best-- Today's parents are very much happy to involve in keeping their kids stylish and fashionable. So kids are set free to access their best in outfits. Especially for boys' it won't be that much difficult for selecting their perfect attire, because nowadays they're well known about their sizes in leaps and bounds. They are very much conscious than the earlier age group, and they would like to make their own decisions especially while purchasing. Excessive exposure to the brands and the latest fashion trends made them brand conscious. This important issue has been well seized by the fashion retailers and they're well aware of this massive transformation of children. This makes them to provide the best collections at extremely valuable price tag. More Passionate Parents: Most of the parents like to imprint their own style on their children's attire, but in most cases it doesn't work as well. This implies that the parents not only impose on outfits but also in various activities like education, language and even in their personal behavior. Since your little ones can't reveal what they want to have, whether they like it or not. They're enforced to wear the clothes that their parents or relatives buy for them and sometimes that may be inapt for their silhouette. However, there are some cases when your children's are being well dressed according to the latest version of fashion rules. Whenever an important event took place in your family whether it will be a wedding or a birthday party, parents are passionate to get their children the fanciest party suits, as it makes them to stand out in the crew. There are various models, colors and styles of boys' festivity suits, therefore parents have to be very much careful while choosing one outfit that is appropriate for their child as well. Tuxedos are Best: There're various collections of suits appropriate for boys like Tuxedo, Blazer, etc. If you want to select the best in those huge collections, I strongly suggest you to opt one of the most stylish boys' party suits with Long Sleeve Tuxedo Suit. This outfit comprises of a cummerbund, a bowtie, one pair of pant, a vest and a suit jacket. This suit is made of compound fibers and cotton extract and the dress shirt is made of polyester and cotton fibers. These are extremely soft fabrics that will make your child feel comfortable all throughout the entire celebration. Since it's so elegant and sophisticated, this will be suitable for special occasions like weddings and christening parties. Your little boy will surely stand out in the crowd and appeal thanks to this classic tuxedo with a long full-sleeve jacket. The pants are extremely suitable to wear due to their elastic and adjustable waistband. The fully lined vest, sleeveless and has a V-neckline and a sharp hem for perfect outlook. Blazers in the Crew: Blazers and vests are the typical boys' formal clothing of all ages. It is the recommended outfit for your little gentlemen especially on social events. Formal occasions require formal outfit for gentlemen even the young ones, blazer and vests are the most perfect combination of boys' formal clothing. Parents should consider several things before purchasing boy's formal wear like the size, color, and style. For energetic children, they should be given clothes that are comfortable when doing different bodily activities. While selecting any type of boys' formal clothing, it should be fit and perfect for kids, and make them to feel comfortable all throughout the party. Hire it Or Purchase: Boys' formal outfits are offered in various ways, either you can avail it by hiring or you can go for purchasing a new one. It is not that much difficult to purchase children's outfit, since there are many dispensers available outside and inside the country. All you have to do is to locate the perfect place where you can minimize the cost. In fact, it'll be quiet costly for getting formal wear for all ages than normal clothes, but still it is worth for its cost. Formal wear uses highly selected fabrics and gets customized exclusively, for such purpose making it somehow expensive than the ordinary one. Opting the Best Fit: Getting perfect boys' formal clothing for your little master's attire is made easier and affordable in our store, which offers huge varieties of little boys' formal clothing suitable for all occasions. They're made available with different sizes and styles. We sell extensive quality boys formal clothing and other kids' garments for over 15 years. As much as possible, buy the little master's items as luxurious and elegant but not much more expensive, it is not required to go for branded boys formal suits because there are lots of choices which will be available for economically simple at cost, just like what we've in our retail online store. In our 15 years of experience in distributing formal suits for boys', we've never ever failed to satisfy our customer's expectation. Our unbeaten years in the clothing industry are a guarantee that we are providing nothing but the best formal wear for kids. In fact, we always see to it that all are products pass the standards and consistency for children's clothing. Our products are selected carefully by our designers team itself. This is to ensure that your little ones will not feel any irritation upon wearing the outfit by using the most delicate fabric for kid's sensitive skin. We always offer our best for the customer as well. Here in our online store MensUSA, we assure 100% satisfaction on buying any of our products. Shop now and realize the great collection of formal suits for boys'. Periodically, we modernize our products to go along with the current trend in fashion. You can definitely assure that all our products are the latest and the hottest style in town. Our latest designs are entirely inspired by today's modern style statement. You can never go wrong with us. 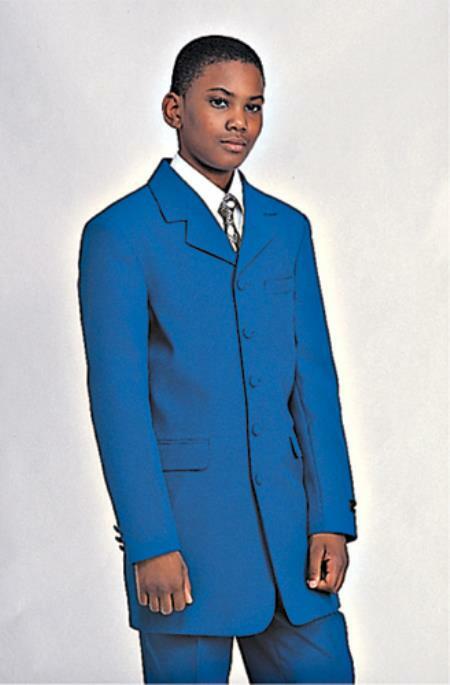 Obtaining the formal suits were made easy by our huge collections of boys suits. View our new products and be the first to experience its best quality. Shop us now and it is our pleasure to serve you better.